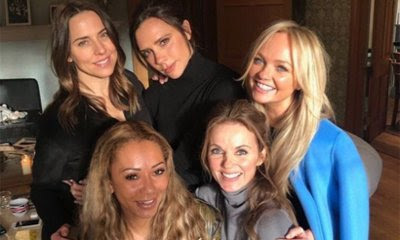 Former Spice Girls manager Simon Fuller has hinted the girl group's reunion tour is on, whether or not Victoria Beckham is involved. The svengali met up with the Wannabe women at singer Geri Horner's home in England last month, prompting reports suggesting the five-piece ensemble was plotting a major comeback but Posh Spice Victoria quickly put the brakes on tour talk, insisting the champagne get together was all business and surrounded the group's legacy. "I think, for us, it’s about protecting the legacy, and asking how we continue the girl power message," she said. "We’re just looking at how we pass that message, as opposed to us going on tour or recording or doing a TV show. It’s not about that. It’s about us looking at the legacy and protecting it. And we all feel the same about that." But Fuller, who steered the girl power group to the top of the charts around the world over 20 years ago, insists a tour is very much on the agenda. Asked by TMZ if the Spice Girls are indeed planning a few shows, he nodded, smiled and said, "It may be four, not five," suggesting Beckham might simply sit out a tour and let her four bandmates take the spotlight. It won't be the first time the girls have hit the road as a foursome - Beckham, Melanie Chisholm, Emma Bunton, and Melanie Brown were forced to go it alone when Geri quit the band in the late 1990s. The girl group last performed together at the closing ceremony for the London Olympics in 2012, but recent rumours suggest they will perform as part of Prince Harry and Meghan Markle's wedding celebrations in May. Speaking on American talk show The Real on Tuesday (February 27), Mel B admitted the band would be attending the ceremony - news she was supposed to keep secret. Asked if she knew anyone who would be going to the wedding, she blurted out, "Yeah, I’m going... I don't know if I should've said that!" She went on to hint that she and her bandmates will be performing, but refused to expand on her comments, explaining, "This is where I'm just like... I need to go. I'm going to be fired!"